While the headline-grabbing weapons in this war have been high-tech wonders, like unmanned drones that drop Hellfire missiles on the enemy below, troops like LeJeune are going into battle with a different kind of weapon, one so stealthy that few Americans even know of its deployment. 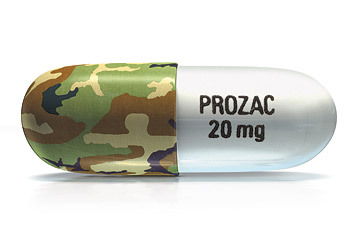 For the first time in history, a sizable and growing number of U.S. combat troops are taking daily doses of antidepressants to calm nerves strained by repeated and lengthy tours in Iraq and Afghanistan. The medicines are intended not only to help troops keep their cool but also to enable the already strapped Army to preserve its most precious resource: soldiers on the front lines.